Dragonfly Neckpiece and Bracelet…Dragonfly Drama. 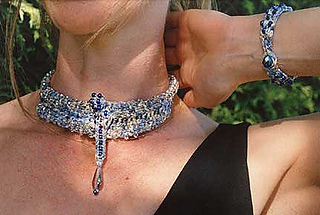 A dazzling and unique neckpiece created in two pieces for a sculptural effect. Two different methods of using beads are used, one for the body, one for the wings and neck cord. The matching bracelet echoes the beading pattern found on the wings of the dragonfly. A correction has been posted to this pattern on April 21, 2009.